previous post: More back to fiat monetary system basics! next post: Bad luck if you are poor! Several readers have asked me about fiscal rules and I have been promising to write about them for some time now. I was finally goaded into action by the current German rush to madness which will see them constitutionally outlaw deficits. When I saw the news that the German government was pushing constitutional change along these lines I thought good – the Eurozone will be dead soon enough and perhaps a better aligned fiscal and monetary system will emerge. Fiscal rules can take lots of different shapes all of which entrench chronic unemployment and poverty. The only fiscal approach that is applicable to a sovereign government operating within a fiat monetary system is one that ensures full employment is achieved and sustained. Anyway, here is an introduction to the mean-spirited and wrong-headed world of fiscal rules. In the June 21 edition of the the Financial times, Wolfgang Münchau’s article Berlin weaves a deficit hair-shirt for us all, confirms that the Germans are going mad. They failed to win World War 2, so they are trying an economic attack on Europe now by introducing a “balanced-budget law in the German constitution”, which will outlaw deficits. Yes, you read it correctly – a law that will prevent the government from running a deficit – ever! From 2016, it will be illegal for the federal government to run a deficit of more than 0.35 per cent of gross domestic product. From 2020, the federal states will not be allowed to run any deficit at all. Unlike Europe’s stability and growth pact, which was first circumvented, later softened and then ignored, this unilateral constitutional law will stick. I would expect that for the next 20 or 30 years, deficit reduction will be the first, second and third priority of German economic policy. So this is an extreme version of a fiscal rule because it is going to be embedded into the German constitution which according to German law can only be reversed by a “two-thirds majority” of parliamentary members. Münchau notes that with the decline of the large parties and the splintering of German politics into small parties, getting 2/3rds of them to agree will be virtually impossible. First, Germany might end up in a procyclical downward spiral of debt reduction and low growth. In that case, the constitutionally prescribed pursuit of a balanced budget would require ever greater budgetary cuts to compensate for a loss of tax revenues. This is based on the policy that would force Germany to start cuting its structural deficits by 2011 and it is not clear that the German economy will be showing any signs of growth by this time. In other words, the new “constitutional law will produce a pro-cyclical fiscal policy with immediate effect.” However, he claims that their could be “a virtuous cycle” should Germany be back by 2011 and “all is well after that, the consolidation phase would then start in a cyclical upturn”. Either of those scenarios, even the positive one, is going to be hugely damaging to the eurozone. In the first case, the German economy would become a structural basket case, and would drag down the rest of Europe for a generation. In the second case, economic and political tensions inside the eurozone are going to become unbearable. Over the past 25 years, France has more or less followed Germany’s lead at every turn, but I suspect this may be a turn too far. The reference to France is based on comments made by the French President in recent days where he said that France will not fall victim to the deficit hysteria and he is more interested in providing fiscal support to employment to prevent unemployment escalating. The Germans clearly have other ideas. … cannot be economic, for there is no rule in economics to suggest that zero is the correct level of debt, which is what a balanced budget would effectively imply in the very long run. The optimal debt-to-GDP ratio might be lower for Germany than for some other countries, but it surely is not zero. While the balanced budget law is economically illiterate, it is also universally popular. Average Germans do not primarily regard debt in terms of its economic meaning, but as a moral issue … This general level of debt-aversion is bizarre. Many ordinary Germans regard debt as morally objectionable, even if it is put to proper use. They see the financial crisis primarily as a moral crisis of Anglo-Saxon capitalism. The balanced budget constitutional law is therefore not about economics. It is a moral crusade, and it is the last thing, Germany, the eurozone and the world need right now. The concept of fiscal rules is not new. Indeed, the Eurozone is being choked by them and the Swiss have their own particular version. Here is a brief analysis of both systems. This little section is taken from my latest book – Full employment abandoned which I wrote with my co-author Joan Muysken. The Stability and Growth Pact (SGP) emerged out of the Maastricht meetings in 1992. The so called Maastricht Treaty 1992 stipulated that countries seeking inclusion in the Euro zone had to fulfill amongst other things the following two requirements: (a) a debt to GDP ratio below 60 per cent, or converging towards it; and (b) a budget deficit below 3 per cent of GDP. It is now widely recognised that these figures are highly arbitrary without any solid theoretical foundation or internal consistency. The rationale of controlling government debt and budget deficits were consistent with the rising neo-liberal orthodoxy that promoted inflation control as the macroeconomic policy priority and asserted the primacy of monetary policy (a narrow conception notwithstanding) over fiscal policy. Fiscal policy was forced by this inflation first ideology to become a passive actor on the macroeconomic stage. As a result of the establishment of the European Central Bank (ECB), European member states now share a common monetary stance. The SGP was designed to place nationally-determined fiscal policy in a straitjacket to avoid the problems that would arise if some runaway member states might follow a reckless spending policy, which in its turn would force the ECB to increase its interest rates. Germany, in particular, wanted fiscal constraints put on countries like Italy and Spain to prevent reckless government spending which could damage compliant countries through higher ECB interest rates. Aided by the growth period following the 1991 recession, the fiscal constraints were met by all aspiring member states. Emboldened by this success, and more alert because the date for the Euro introduction was approaching, the Euro countries decided in the 1997 Amsterdam Treaty that the rules should be sharpened. The deficit should be either zero or in surplus, and when it threatened to reach 3 per cent of GDP, countries should take appropriate measures. This requirement, formalised in the SGP, was criticised by many economists. Even economists operating from within the so-called orthodox deficit dove paradigm argue that there is no rationale for zero government debt, which a zero deficit would imply in the long run. While the doves work within the government budget constraint framework, which is flawed at the most fundamental level, these economists still argue that it is more fruitful to concentrate on stimulating economic growth, than it is to anxiously guard government deficits. From the dove viewpoint, public borrowing is constructed as a way to finance capital expenditures. Since government invests a lot in infrastructure and other public works, those investments should at least allow for a deficit. This was already recognised by the classical economists as a golden rule of public finance. So even within an orthodox public finance model, the stipulations of the SGP are difficult to justify. The requirement that budget deficits should be zero on average and never exceed 3 per cent of GDP not only restricts the fiscal powers that governments would ordinarily enjoy in fiat currency regimes, but also violates an understanding of the way fiscal outcomes are effectively endogenous. Any economist with even the simplest understanding of the way in which automatic stabilisers operate will see the lack of wisdom in the SGP rule. A sharp negative demand shock which causes an economic downturn will reduce tax receipts and increase benefits, automatically increasing the deficit. Reducing government expenditures in that situation to meet the rule will worsen (prolong) the recession, which is then likely to involve the country in further SGP rule violations. The vicious circle of spending cuts implied is unsustainable and amounts to fiscal vandalism. In other words, fiscal policy becomes pro-cyclical under the SGP rule violating any sensible ambitions that are the ambit of responsible fiscal management. This is the major reason that France and Germany have refused to comply with the 3 per cent rule over the last several fiscal years (prior to 2008). Another problem relates to the bias in the way fiscal adjustment is conceived. In particular, it is automatically assumed that discretionary actions to reduce the budget deficit will involve spending cuts rather than increasing taxes. We cannot help but have the impression that some politicians are not primarily concerned about the size of the budget deficit, but covet the 3 per cent rule as a welcome excuse to force their ideological predilection for small government. In other words, the ideological bias against public activity, particularly in the social security sphere, is dressed up as prudential economic management to give the crude religious zeal an air of authority and respectability. The SGP rule cannot be seen in isolation of the acceptance by EU countries of the voluntary monetary policy straitjacket that the ECB acceptance imposes. While the ECB now has a monetary policy monopoly across the EU countries, it is not politically responsible for its actions. The EU countries have voluntarily allowed the ECB to be an unelected and independent body whose sole aim is to control inflation. The fundamental democratic principle that the citizens have the ability to cast judgement on the policies of their representatives at regular intervals has been abandoned in this setup. This voluntary monetary policy straitjacket suggests that countries have to use fiscal policy to react to economic shocks which affect the real economy. However, the SGP has imposed an inflexibility on this discretion and stagnant economic outcomes have been the norm. It is often said that the European economies are sclerotic, which is usually taken to mean that their labour markets are overly protected and their welfare systems are overly generous. However, the real European sclerosis is found in the inflexible macroeconomic policy regime that the Euro countries have chosen to contrive. The rigid monetary arrangements conducted by the undemocratic ECB and the irrational fiscal constraints that are required if the SGP is to be adhered to, render the nation states within the Eurozone incapable of achieving low levels of unemployment and increasing income growth. These observations lead to our more embracing criticism of the Brussels-Frankfurt consensus from the perspective of the functional finance paradigm. As we argue in Chapter 8 there is a difference between governments being financially constrained and situations where governments accept voluntary financial constraints. The SGP coupled with the common ECB monetary policy is an example of the latter but does not negate the fact that EU countries could exploit the powers that issuing fiat currency provides them. They would make this choice if they wished to pursue a macroeconomic strategy aimed at restoring full employment with price stability. The Swiss have implemented a less rigourous version of the proposed German fiscal rule – which they call the debt brake. The public debate in Switzerland became tense during the 1990s as the budget deficit increased. Public debt also rose due to the voluntary rules that the Swiss Government imposed on itself to issue debt $-for-$ for the net spending. The claims at the time was that the existing political processes were not sufficient to offset this alleged deterioration in the budget position. The deficit nazis fuelled a public resentment against the rising debt, even though the debate was based on totally unfounded principles and so the idea of putting the nation into a fiscal strait-jacket was also politically popular. It is another one of those situations, where the public thinks it is good for their government to whip them. Anyway, in 2001 the Swiss Constitution was changed (84.7 per cent of the vote was yes) to enact the “debt brake” which was meant to begin its disciplining role in 2003. But in that year, recession hit the Swiss economy and so the new system was brought in over several years until the brake would operate in full from 2006.
where k = Y*/Y. Here G is government spending, T is total taxation, Y* is trend real output (assumed to be potential output which is highly controversial – I will come back to this soon), and Y is actual real output. Accordingly, the rule says that G > T when Y < Y* and vice versa. When Y = Y* (that is, the economy is producing at capacity) then the budget will be balanced and there will be no net financial assets created by net public spending. It also means that when Y = Y*, non-government saving will be zero. More about this later. The debt brake is also quite different to the Stability and Growth Pact (SGP). In the SGP that adjustment is one-sided – there is an upper ceiling. In the Swiss debt brake, adjustments are required in both boom and bust. So you can see the logic. First, on-going deficits are alleged to be impossible. Second, the aim was to avoid “pro-cyclical” fiscal policy which has been a major criticism raised against fiscal policy activitism by the conservatives. It is alleged that by the time fiscal policy starts to work the business cycle has already turned and so you get expansion on expansion which is inflationary. The problem then is that the deficits are typically cut back as the economy starts to recess which makes the pain of the downturn more intense than otherwise. There are some other characteristics of the debt brake. First, while the expenditure rule is meant to be solid, an absolute majority of both houses of the Swiss parliament can vary the budget outcome in what is termed “exceptional circumstances” – that is, serious global recessions, major wars, natural disasters etc. In those circumstances, deficits can be higher than allowed for by the rule. Second, in practice, T is estimated one-period forward. The expenditure rule is then supplemented with a so-called “stabilisation account” which recognises that the forward revenue estimates may be inaccurate which will throw the expenditure off the rule-driven path. But this is just an accounting structure which provides feedback to the government in framing future budgets. So if spending deviates from the “spending limit” then a credit/debit is made to an adjustment account which has to be reversed in subsequent fiscal years (there is an adjustment formula that governs these transitions). Accordingly, if the government is too optimistic about tax revenue (which means it would spend more than warranted under the rule once actual tax revenue is known) then the stabilisation is debited with this difference. These stabilisation account “deficits” then have to be considered in future budgets such that expenditure ceilings in subsequent periods will be less than would be allowed to make sure the stabilisation account was being credited until its balance was zero. In terms of the impact on public debt dynamics the rule is clear. There is no attempt in the Swiss rule to distinguish between the so-called primary budget (G and T) and the interest-servicing component which can be positive even if G < T because of liabilities to service outstanding debt. So the total allowed expenditure is the sum of these two components. If the government imposes the voluntary constraint on themselves that all net spending has to be matched $-for-$ by debt issuance and all surpluses are used to retire outstanding public debt then the changes in outstanding public debt is straightforward. When real trend GDP > real GDP, the budget will be in deficit and public debt rises in proportion to tax revenue. Alternatively, when real trend GDP < real GDP, public debt declines in proportion with tax revenue. Economists calculate various elasticities (responses of one variable to another) to show the impact on the debt/GDP ratio over the cycle. It is not worth repeating all the nonsense. Suffice to say that the rule makes sure that the ratio is stable or declining which is seen as a major advantage. For me it is irrelevant. There are many issues that suggest the debt brake will produce anomalous outcomes – these are technical issues about symmetry and amplitude variations of cycles etc. But there are two fundamental issues which make it a fundamentally flawed approach to fiscal policy. First, it is important to note that Y* is an estimate of trend-GDP. Trend GDP does not have to equal full employment GDP. How do we calculate trend GDP? This issue has bedevilled economists since day one and various statistical techniques have been used over time. In recent decades the Hodrick Prescott (HP) filter, which is a linear smoothing algorithm, has been increasingly used as the preferred method to estimate trends by many researchers (not me!) and international agencies (for example, the IMF, OECD etc). Basically, it is simple to use and is (nearly) symmetrical over the cycle (despite the real world exhibiting asymmetric cycles). Anyway, I could go on all day about the abuses that emerge when using HP filters – but I won’t! 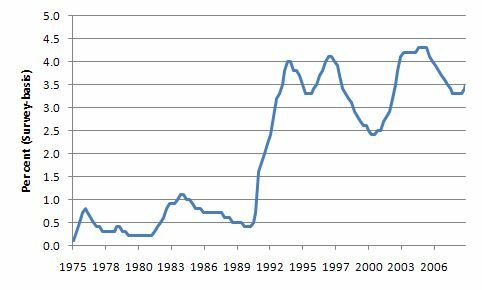 To show you how stupid this fiscal rule using HP-estimated trend real GDP I did a little calculation for Australia and produced the following graphs. 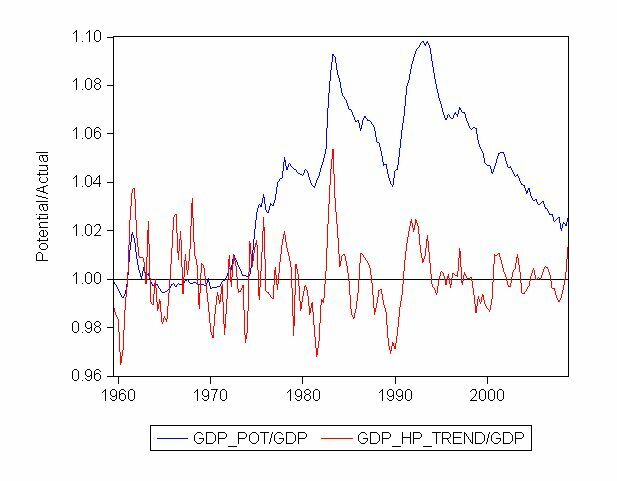 the red line is the ratio of real trend GDP to real GDP where the trend series is basedon a Hodrick-Prescott filter. So how do you make any sense of this? Easy. a Swiss-type fiscal rule would require the budget to go into surplus any time the red line was below 1 (the unity line is drawn in the graph) and allow the budget to go into deficit when the red line was above 1. To see what it means against the state of the business cycle defined in terms of the evolution of the official unemployment rate the following graphs are interesting. The left panel plots the unemployment rate (horizontal axis) against the ratio of real potential GDP/real GDP (potential calculated at true full employment) (vertical axis). The right panel plots the unemployment rate (horizontal axis) against the ratio of trend real GDP/real GDP (trend calculated using HP filter). This really shows you how bad this sort of trend GDP rule would be. Fiscal policy in the left-hand panel will always be supporting higher employment growth in the context of a chronically demand-deficient economy. However, in the right-panel, fiscal policy would not have any consistency at all but would always deliver deficits that would be lower than required to restore and sustain full employment. The second fundamental issue which follows from the first is that the approach ignores that basic fiscal policy function – to fill the spending gap. The only sustainable fiscal policy approach is to ensure that net government spending is sufficient to fund the net saving desires of the non-government sector. End of story. In the last two days (at the UNDP workshop that I have been talking at) I have heard constant reference to the term “fiscal room”. The way the reference was expressed reflected the straitjacket that the neo-liberal approach has the policy world in. I responded to the audience by saying that fiscal room is an irrelevant concept unless we consider there are no spare real resources available. In the context of the audience (many participants from Latin America), the millions of unemployed tell me that there are stacks of real resources available for deployment. Thus when there is a positive desire to net save by the private sector then the government sector has to be in deficit to ensure there is enough spending left in the system to underwrite production levels consistent with full employment. Perhaps there will be a silver lining in this madness. It might be the last straw for the Eurozone which would force the countries to rethink the system and preferably provide some coherent currency sovereignty in line with the monetary arrangements – so kill the zone altogether or create a single fiscal unit. Anyway, one more day mixing with senior UNDP officials who manage a range of social programs and are trying to get their heads around employment guarantees as a way to redress poverty in less developed countries. My favourite topic but unfortunately the alleged fiscal constraints keep coming up. While these policy makers clearly see the need for higher employment rates in the LDCs most are still operating under the spell of neo-liberal macroeconomics. This is sad for the millions in their countries that would love to work and find a self-determined way out of poverty. I forgot when I was writing this earlier today to include this graph of the evolution of the Swiss unemployment rate since 1975 to the end of 2008 (it has risen a bit since 2008 as the crisis has unfolded). One of the reasons their deficits increased was because their economy was affected by the 1991 downturn. So the automatic stabilisers were working to attenuate the downturn in the business cycle. It is totally misguided to attempt to cut back on a deficit in structural terms (that is, alter discretionary policies settings) when it is being driven upwards by the automatic stabilisers. That amounts to vandalism. The unemployment rate history tells me that the Swiss economy needs significantly larger deficits than it had and the recent introduction of the debt brake will only entrench this unemployment – and entrench disadvantage. If Australia had adopted that policy, the government would have been slashing tens of billions worth of regular expenditure. Where would they cut from? Their contribution to the state health systems? Education systems? I have added a graph to this blog at the end. It shows the Swiss unemployment rate and gives you an idea of: (a) why their deficit was rising in the first place; and (b) why cutting back via the debt brake is nonsensical. Bill, a technical question. How exactly do you calculate real potential GDP. Based on the chart with the straight line, I assume you have modeled the ratio of potential to actual as a straight line (taking the value of 1 at unemployment of 2% as you noted), but how do you determine the slope?